How do I attach copper lines to an AC compressor? 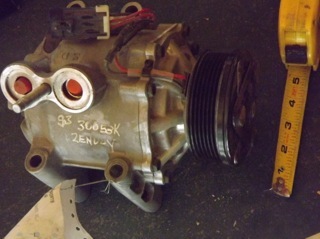 I'm using an auto AC compressor for a non-automotive application. (A heat pump). The balance of the system piping is copper lines. Does anyone have a suggestion how to adapt from copper tube and connect the AC compressor? I must assume from the question that you do not have what fits the compressor. 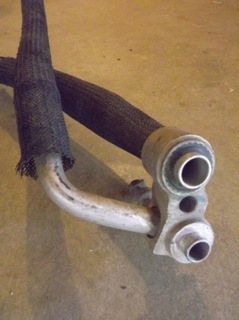 The factory hose or fitting arrangement could be found from a donor car that uses the same compressor, or new replacement parts. Then you can use various threaded adapters and/or connectors; or by fabricating, welding, brazing, "sweating", flaring, or whatever is required to make the most approriate, reliable, leak free connection. Thanks for the reply, HECAT! 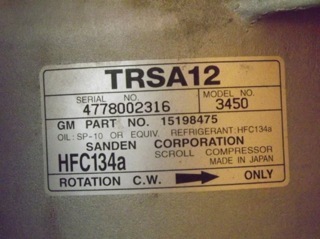 The compressor is a Sanden TRSA12. It looks like it comes with a few different connection types. Would one style work better than another? Is there a particular hose set that would be easier to adapt to? You could buy any hose set to cut off the pad. You find pads by searching Docs Blocks. You are going to have to fabricate your own solution. Get a fitting from Docs Blocks as Hecat said. Get the steel version. Then use 45% silver solder with the proper white flux and braze the copper to steel. Typically, HVAC compressors operate at a much higher pressure, have copper fittings, are direct driven, and have an oil sump where oil is not circulated throughout the system. MVAC compressors, operate at a much lower pressure, rubber hose type fittings, can be made of aluminum, are belt driven that greatly reduces the efficiency, and circulate oil throughout the system, that also reduces the efficiency and will give you a calculation problem. Would consider using an HVAC compressor for your application. Even not knowing what it is. There are only 2 basic TRSA12 configurations for GM but both have similar ports, just rotated on the comp housing. There are 2 mounting configurations for GM, one for 6 cyl and one for V8 application. Chrysler electric vans had a semi hermetic 33cc scroll comp used as a heat pump with Ranco reversing valve because hp used less battery power than resistance heat. Thanks again for the helpful replies. I especially appreciate the specific instructions Dougflas. NickD, I've been designing with your considerations in mind. The upper high side operating point is 200psi. I'll couple my power source directly to the compressor shaft - no pulley. I plan to use an oil separator, such as the Henry S-5185. Would you suggest another? I had hoped to use a TRSE09 with a built in oil separator, but it was too small. Could you suggest a scroll open drive HVAC compressor? A volume 150 - 200 cc would be helpful. hodrodac: Do any of the TRSA12 models have CCW rotation? It seems that models 3450, 3452, 3454, 4910 have CW (right hand) rotation. I looked at Docs Blocks - What block style mounts to which TRSA12 model? Thanks for the Temprite separator tip, hotrodac. I didn't have much luck calling Docs Blocks - the sales lady said they had no technical staff to answer questions. 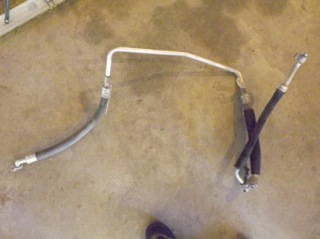 I bought a TRSA12 and a hose set from a Chevy Trailblazer. The metal parts are aluminum. Can I make an effective flare connection to the aluminum tube on the hose set? The suction line is .75" OD, and the discharge is .61" OD.